Consumerism – ahem – the holiday shopping season is upon us. I don’t usually go all-in, but this year, I grabbed two things that I plan to use with my bass, even if not in a direct manner. On Black Friday, I grabbed a digital camcorder. I’ve wanted one for a while, and since attending the Metal in Strange Places conference this year with the wife, I decided to pull the trigger. The problem I was looking to solve is this: the panelists and presenters are smart. They share interesting and enlightening information about metal that would never occur to me. Once they’ve had their say, that info is gone. Its resides somewhere between them and the memories of their audience. I hate that. I hate that once its been said, its done, and no one will be able to hear and learn from those moments again. I videoed my wife‘s panel this year. She was part of “Looking for Metal: Rethinking Methodologies in Metal Studies” and spoke about netnographies in metal research, a new concept which are essentially online ethnographies. The quality from my little recorder wasn’t very good though, and the battery only lasts for an hour and 15 mins before needing a recharge – its not removable. I did a separate video for Maisie Kaiser, who presented “The Myth of ‘Genderblindness’ in Metal Culture“. I used her phone and it does seem to have come out better. She shared it online, and it looks and sounds good. I wanted to record all of it though. I spent a while looking at different ways to do this and spoke with Nelson Varas-Diaz, a metal video documentarian who produced “The Distorted Island: Heavy Metal and Community in Puerto Rico” and “The Metal Islands: Culture, History and Politics in Caribbean Heavy Metal Music“. He suggested a DSLR camera, which we have, but research led me to rule it out. DSLRs can record video, but in order to avoid paying some kind of increase for their sales due to reclassification, they’re limited to 10-minute videos, which simply won’t work for panels that last more than an hour, and audience questions. 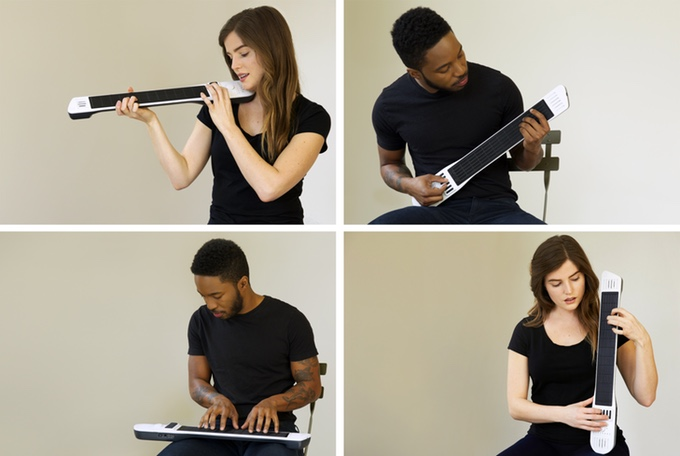 Last night when I was reading, I came across this really interesting new electronic instrument called the Artiphon Instrument 1. Its an instrument/interface that has a fretboard kind of like a keyboard and flap/levers that simulate strings. Its able to create a huge array of sounds, from guitars, basses, ukuleles, violins and cellos to pianos (with 6 octaves), drum sets and even more. The device got going on Kickstarter and has apparently started shipping recently. The goal was to raise $75k, but they were able to bring in $1.3M. It looks like it retails for $400 and has an interface that works with iPhones and maybe Mac computers. I don’t know if an Android or PC interface exists yet. I watched a few videos of it, and it looks really impressive. A jazz guitarist in the main video even commented that he’s able to simultaneously play 2 notes on the same string in guitar mode – something that’s physically impossible with real strings. That could be really fun for players of chordal instruments. Here are links to the Kickstarter page, the main Artiphon page and their Youtube page. I can see this taking off in some circles, especially among electronic musicians who also play real instruments. Its not a bass, but its still Thanksgiving! Happy Thanksgiving, my fellow beastly Americans! We just pre-gamed lunch at my place and are heading out to my sister-in-law’s shortly for round 2. In the meantime, I was reading the Talkbass forums instead of actually practicing on my bass and found a thread from quindecima, a pianist-turned-bass player. He can read music and has no problem finding notes on the piano, but is having a hard time translating that to bass, because the fretboard isn’t laid out in precisely the same manner as the piano keyboard. He asked for advice about learning the notes on the fretboard. Here’s what helped me most with learning to read. Instead of thinking of a note (e.g. that the third line is “D”), I started thinking of intervals. Find the first note of the phrase, and read the interval from there. So if the first note is the third line, and the next note is the fourth line, it’s a third; major or minor depends on the key and accidentals. To get there though, you need to spend time working through the fingerboard. So start with just grabbing notes and naming them. Learn a few key patterns- e.g. the octave is two frets up and two strings across, a perfect fifth is two frets up on the next string, minor 3rd is three frets on same string, etc. Find all the Es on the neck, then the Bs, etc. through the circle. And this is where real dedicated practice of the diatonic major scale comes into play. Don’t just run the scale, but name each note as you play it- For example, instead of just wiggling your fingers through a C major scale do this: Say “one, C” and play it. Then say “two D” and play it. It reallyt helps to “sing” the note and you want to do that BEFORE you play it. That fixes the sound of the intervals into your head and your mind coordinates that with the fingerings- helping you play by ear too. But I think it’s really important to get away from thinking “second line is third string at 2nd fret” thinking and get to hearing the music from the score. So, last night, instead of working through the Hal Leonard book, I experimented with chord tones. What I wanted to do was find all of the chord tones over a 2-octave range and see what kinds of sounds they bring forth. I ended up really liking minor chord tones over 2 octaves. There are some really nice, melancholic sounds available when you have a low root and travel up to a higher octave’s 3rd and 5th. I limited myself to 4 strings and tried not to change position too much, so I didn’t have a way to easily incorporate a higher 7th chord tone, but the first octave’s 7 plus the second octave’s chord tones provided a lot of fun sounds to experiment with. 7ths didn’t get used very much though. I know they’re used more in jazzy lines, and my guess is that at this stage, my ear is drawn to more rock or pop lines & tones. I also found that, in general, when traveling upward, I was able to stick mostly to chord tones, but when traveling back down, I’d add in a passing tone from the scale. Anthony Wellington just blew my mind. Again. Garret Graves, on Talkbass, posted a link to a Fodera clinic he did just a few months ago. Its called “Modes for 4, 5, 6, and 7 String Bass“. The video is an hour long, but what he shared can be condensed into about 15. The rest are jokes, repetition and making sure the crowd is following what he says. In a nutshell – he shows 3 finger patterns that are used for all of the modes of the major scale and how to remember and play them all from one position on a 7-string bass. This is easily reduced for 4, 5 and 6 string bass – and then he has an audience member who has never touched a bass with more than 4 strings come up and actually do it on a 7-string. I can’t believe what I just watched. I tested it out on the C major scale and A minor scale, because I know those patterns and know that those particular scales have no sharps or flats. They worked. I double-checked by confirming all of the notes on a diagram of a 6-string bass neck. It checked out. Anthony is right. Music is math. When we press frets on the neckboard, we’re plotting points on a graph. He made a few really interesting points in his clinic about the modes – one of them being that there aren’t 7 modes. There’s really just one big mode. Seeing it plotted out on a 7-string bass really drove that home. Seeing how, with a 4, 5 or 6 string bass, we’re looking at a smaller section of that mode also makes sense. Knowing that from his one pattern, we can play any mode is just plain jaw-dropping. I can see how practicing it will eventually let us use the patterns to play starting on any degree of a given scale as well. We took a trip to Brooklyn yesterday. It wasn’t far, and with traffic, we made it in an hour. My main goal: try an acoustic lefty bass that I’ve seen advertised on Craigslist. I’ve been watching it for more than a month. It vanished around Halloween but was relisted last week. The bass I was looking at is a Dean EABC L 4-string cutaway acoustic. It had good reviews online and generally retails for around $250 for the righty models. The seller, Vincent Soyez, listed his for $120. For a lefty like myself, that’s a magnetically-attractive offer. I contacted him yesterday, and we met at his apartment today. After trying it, we had a small chat and I took a chance on it. He threw in a guitar stand for free! The bass is huge. I thought my 6-stringers were big, when viewed alongside my old 4-string. Well, this dwarfs the 6’ers. Its so wide, its almost the same width that their bodies would be if I laid them sideways, and its taller than my 4-year-old daughter. Being a hollow-body (my first!) its also much lighter than my 6-stringers – and its pretty loud. Bear in mind, I usually practice without plugging my electrics in, so audibility is a whole new concept to me. Practice is also somewhat different – the strings are some kind of roundwound copper-colored metal. Vincent said they’re the original strings. I’m not a gear expert, so I can’t really speak to them much, but they sound fine to me. Talkbass says that they’re “phosphor bronze acoustic bass strings”. The neck is longer than my others, so fretting the low notes is a little different. It should be manageable though, with some repetition. I’m really curious about other types of strings with this – especially flatwounds and tapewounds – but it’ll probably be a while before I experiment. I’d love to approximate an upright bass sound with this, if I can. Every October, we listen to a lot of Misfits, because of Halloweeen. Due to this, I’ve had London Dungeon in my head for a bit. I’ve always loved the bassline to it. A few mins ago, I decided to see if I could find it, and, lo-and-behold, I found the main melody instead! Its just 6 notes (E-B-G-A-G-F#), all on the E string (although it could be played from the E & A too). Here are 3 different ways to play it, on the E string, and using the E & A strings (the last makes use of open strings for both, and is tricky for me – the mostly-closed pattern in v1 is easiest). My wife just stepped out of the shower and I played it for her. Her response was, “Its a punk song. How hard did you think it would be?” Wife-1, Seratonin-0.